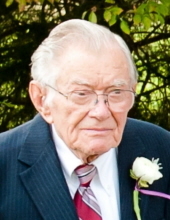 Thomas Byron Turner, 90, of Fayetteville passed away on Wednesday, January 23, 2019. He was born on March 14, 1928 in Fayetteville, GA to the late Jenellie and Arby Turner. He was a member at Bethany United Methodist Church in Fayetteville. He owned and operated Turner's Welding Service since 1971. Byron was preceded in death by his parents and great-granddaughter, four sisters and four brothers. He is survived by his wife of 67 years, Madge W. Turner; his daughter, Diane (Tony) McFarlin; his son, Jeff (Debbie) Turner; his daughter, Lynn (Barry) Stephens; his daughter, Milinda (Frankie) Flanders; his daughter, Kris (Brad) Majeres; and his son, Kyle (Alicia) Turner; fifteen grandchildren and eighteen great-grandchildren. A funeral service will be held at 3:00 PM on Saturday, January 26, 2019 in the Chapel of Mowell Funeral Home, Fayetteville, with Rev. Herb Flanders, Rev. Mike McFarlin, and Rev. Garrett Wallace officiating. Burial will follow at Bethany United Methodist Church Cemetery, Fayetteville. The family will receive friends from 1:00-3:00 PM prior to the service at the funeral home. The family requests no flowers. Donations may be made in Byron’s memory to St. Jude’s Children’s Hospital, https://www.stjude.org/, or to Bethany United Methodist Church, 607 Rivers Road, Fayetteville, GA 30214. To send flowers or a remembrance gift to the family of Thomas Byron Turner, please visit our Tribute Store. "Email Address" would like to share the life celebration of Thomas Byron Turner. Click on the "link" to go to share a favorite memory or leave a condolence message for the family.